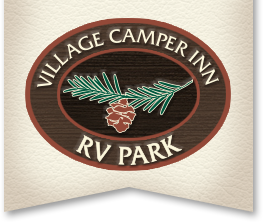 Village Camper Inn RV Park offers campers the best of both worlds! Between the Redwoods National Parks and the Pacific Ocean, our guests enjoy both the majesty of untouched old-growth forest and the adventure of wild coastal beaches. Our spacious RV Park campground is nestled in a quiet forest setting–so close to nature, yet we’re only two minutes from the services and conveniences of Crescent City on California’s Highway 101.